Now, first things first. This recipe is not mine. 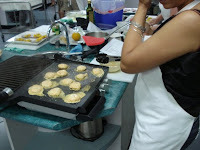 I learnt it at Sydney Seafood School. So the recipe featured here is courtesy them. And you know what? If you don’t try this recipe, I think you are not foodie enough :), more so if you are a seafood lover. So then get set, bring home that barbeque, call your best pals, order in the best wine, throw a party, and show off your culinary skills. Ready to toss some Scallops? 2 red Shallots, finely Chopped. 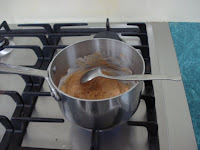 Heat a couple of tablespoons of the thickest coconut cream (from the top of the tin) in a small saucepan as shown below. Add red curry paste and ginger and coconut till fragrant. Remove from heat and add palm Sugar, stir to dissolve. 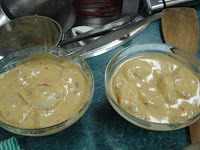 Place Mixture in a small bowl and add remaining coconut cream. 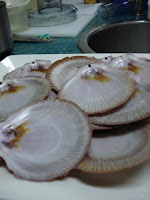 Remove Scallops from shells, wash and dry shells. Combine Scallops and red curry mixture, mix well and stand for 1 hour. Meanwhile, make the salsa: Combine all ingredients in a bowl. Set aside. 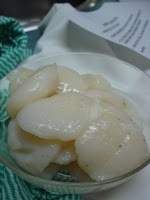 Now, after about 45 mins to an hour, take the marinated scallops and cook them on heated oiled char-griller for about 1 minute each side, till they become opaque. They cook super fast, so be careful not to over-cook it. 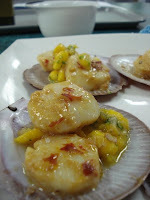 Place spoonful of salsa on the shells and top it with Scallops. Whoa! Its ready to give your guests a very pleasant shock! 1. I think this recipe as is can be used for shrimps too. This is just in case you don’t get Scallops. 2. This is generally served and complete with a grilled fish and bread. 3. If there is no wine, please don’t dine :). No, really, white wine goes fabulously with this! So long then! Bon Appétit! You, Him and a breakfast full of Love!! 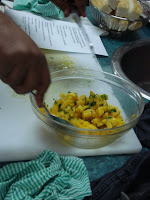 Step 4: chop onions, coriander, green chilies, lemon wedges. Step 5: Add salt, Red chilly powder (optional), Chaat Masala and squeeze the lemon into the mixture. Add the rest of the stuff, mix well. # Add boiled potatoes and tomatoes to make this a heavier, fuller snack. # The roasted sweet corn on cob by itself is yummmmmy- spread butter over it and bite in, else, try it the usual way with lemon juice, chilli powder and salt. #The chaat as mentioned above is excellent as a starter in parties, and sure to set a few tongues wagging about how J they are of your chef-giri.